We install house extensions in homes across Dunfermline, Edinburgh, Stirling, Perth, Dundee, Fife, Rosyth, Glasgow and surrounding areas. 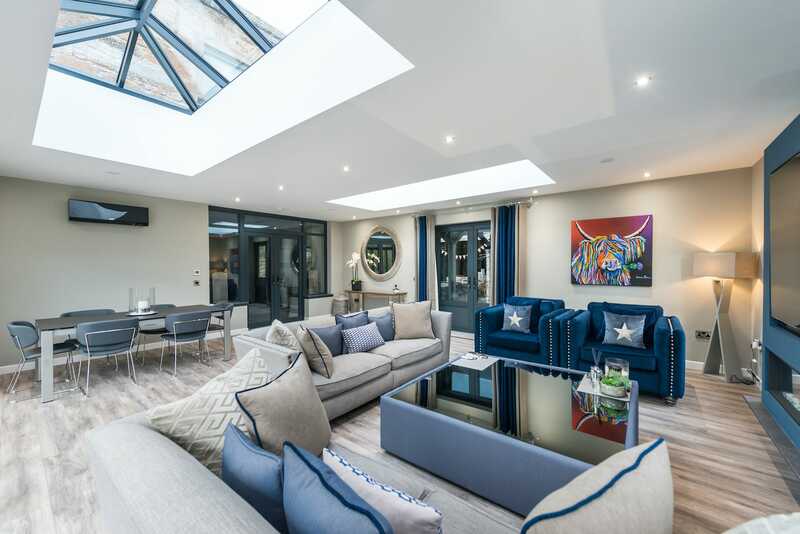 As the modern solution for bringing a bright and spacious feel to your home, our house extensions combine industry-leading glass conservatory roofs with high performance glazing. This combination allows you to let the light in while always remaining comfortable. We have an incredible variety of materials on offer and allow you to benefit from a house extension that is designed to your exact specifications. Whether you’re in the market for a solid, tiled or glass roof, SRJ will have the product for you. With this in mind, you’ll be able to redefine your living space by controlling not only the overall light allowance but also light placement. Whether you’re looking to bring a focal point to your home, or wish to enjoy a bright and spacious feel, the choice is yours. Finally, our numerous house extensions are structurally designed to accommodate the wind and snow loads in your area. This is precisely achieved through NASA satellite data, allowing us to take a modern approach to offer you better standards. Keeping the winter winds at bay has never been easier, with high performance glazing helping to keep the heat from your central heating inside your home for a longer period of time. This is combined with super-insulated columns and an insulated internal pelmet to keep the warmth from your central heating inside your home. We know that houses can come in a wide range of shapes and sizes, which is why we offer our house extensions in a wide range of styles. You’ll be able to choose from double hipped with box gutter, P-Shape, Georgian, Lean-To and Gable. Whichever one you choose, you’ll be able to enjoy a completely perfect fit, made better with industry leading standards. To bring a personal touch to your home, you’ll be able to choose where the glazing panels are placed, as well as the fascia colouring to ensure you get something that perfectly complements your home. If you feel you’re lacking inspiration, a member of our friendly team will be more than happy to help you find something to suit your home: no matter its style. It’s understandable that you want to enjoy your new house extension as quickly as possible, without compromising on any quality. To help with this, all our house extensions are manufactured in full compliance with building regulations and planning permission standards to avoid any costly or timely processes that can delay how quickly you’ll be enjoying your new addition. Our house extensions are sure to be a worthwhile investment for your home, accompanied with a comprehensive 10-year guarantee to cover you in the unlikely event of any failings. We’ll be on hand to ensure any problems that you have are sorted as soon as possible, so you can rest assured that you’re getting exceptional quality. As our house extensions are manufactured using premium grade materials and industry-leading techniques, you can be sure that they will continue to keep you safe and comfortable for many years to come. Further to this, intelligent technology ensures that your extension won’t be unusable at any point of the year. You’ll be able to avoid the ‘freezer’ and ‘oven’ effect that has become infamous with older designs. We combine the incredible Classic roof design with the latest high-performance glass in order to craft a market-leading house extension. The masonry piers and super-insulated columns an offer structural strength and thermal efficiency, and the expansive glazing allows for plenty of natural light to flood your home, brightening up the atmosphere. Combine solid and glass roofing products with these amazing house extensions. Highly flexible and incredibly secure, this impressive design is crafted with the Livinroof profile. You can therefore rest assured that your new product has been designed to the strictest specifications, meaning you can benefit from a secure and thermally efficient home. 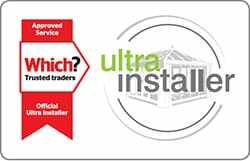 Similarly, our tiled roof house extensions have been crafted to the specifications outlined by the Ultraroof profile. This bespoke design fuses the thermal capabilities of insulated columns with the lightweight nature of our roofing tiles. The result is a warmer, durable house extension that delivers incredible views and a professional design. If allowing sunlight into your home is the most important factor in your home improvements, then our sunroom extensions are easily the right choice. These amazing products can be customised in a range of RAL colours and can add a breath of fresh air to your home in the form of a new living space or dining area depending on your preference. Get in touch with us via our online quoting engine to get a free, instant and competitive glass house extension price. Alternatively, you can reach out through our online contact form. We’ll be more than happy to offer you a bespoke quote, or you can get in touch with us via this method should you have any questions. You can also visit our Fife showroom to come and see how beautiful house extensions really are.